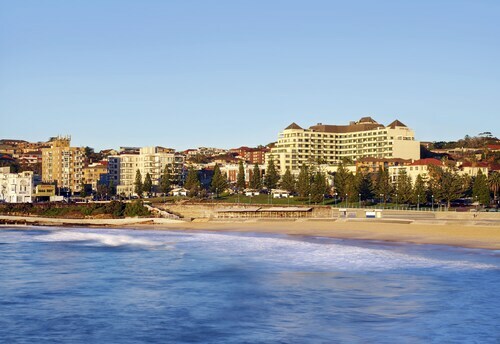 Nestled on the beach, this Sydney Eastern Suburbs hotel is within 2 mi (3 km) of Coogee Beach, Clovelly Beach, and University of New South Wales. Bronte Beach and Maroubra Beach are also within 2 mi (3 km). 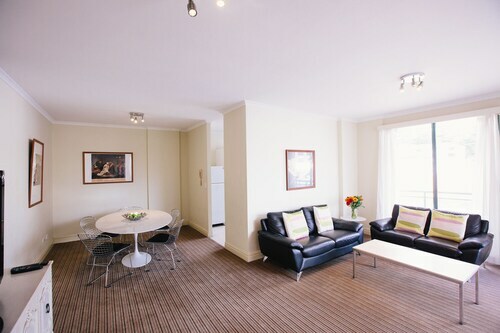 Located in Sydney Eastern Suburbs, this luxury apartment building is within 2 mi (3 km) of Coogee Beach, Clovelly Beach, and University of New South Wales. Bronte Beach and Maroubra Beach are also within 2 mi (3 km). If you love Bondi Beach’s but can do without the crowds, give Coogee a try! Just a 12-minute drive from Bondi, it has the same kind of cool blue water, rocky coastal walks and chilled beachside cafes, but without the tourists. Relax in a saltwater bath, sip a latte, tuck into an organic breakfast or do some boutique shopping. 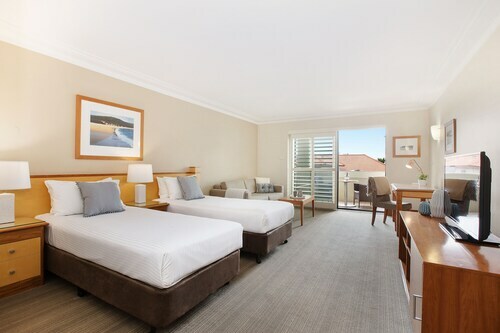 It’s all just a short walk away from the beach when you book one of our Coogee hotels. Coogee is an Aboriginal word for "smelly place", and the name was inspired by the seaweed that washed up on the beach. But don’t let that put you off - these days, the seaweed is removed before it starts to pong. Coogee became a village in 1838 and was connected to Sydney city by electric tram in 1902. In 1926, Coogee was keen to promote itself as Sydney’s biggest beach resort and opened The Coogee Pier. With a restaurant, ballroom and 1400-seat theatre, Coogee Pier was pretty spectacular. Sadly it had to be demolished after it was damaged by rough surf and storms. But don’t worry, Coogee Beach is a pretty calm place to swim. It’s protected from swells by Wedding Cake Island, a tiny rock island that inspired a Midnight Oil surf-rock jam. Coogee Beach is a patrolled beach with a reputation for being safe and family-friendly. The clear blue water shimmers in the sunshine and the headland has dramatic views of hillside mansions. At the south end of the beach is Grant Reserve, a picnic area with walking tracks and a children’s playground. Don’t feel like swimming at the beach? Relax in one of the public baths like Wylie’s Baths, a 50-yard tidal pool beneath the Maroubra to Bondi cliff walk. You’ll see amazing views of the ocean, the beach and Wedding Cake Island. Coogee is also home to McIver’s Baths, Australia’s last remaining public baths for women and small children only, which has been running since 1876. The streets around Coogee beach have everything you need for your stay, whether you’re after a coffee, some take-away pizza or a new pair of board shorts. If you don’t mind a long walk and love ocean views, tackle the Bondi to Coogee Clifftop Walk. At six kilometres, it’s a long walk but hardly a trek through the wilderness, as along the way you’ll find beaches, parks, restaurants and change rooms. It’s split into six sections, and if you’re not up to the whole thing you can still walk a little and catch some of those amazing coastal views. Start by booking your flight to Sydney and Coogee accommodation with us. From there, buses, trains and taxis are plentiful in Sydney and with no trouble at all you can get around and see the sights. And if you want to spend some time in Bondi too, it’s only a drive (or a walk!) away. Have the best of the beach with a trip to Coogee. 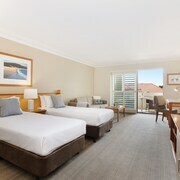 Hotels in Coogee start at AU$109 per night. Prices and availability subject to change. Additional terms may apply. We had a great view of the beach and good position to the shops.Bathroom in room was small bad design fogged up no vent.